The cheetah’s pale yellow coat with black dots, the striking black lines along the inner corner of each eye to the outer corner of the mouth, and those striking eyes, will mesmerize you try as try to get a closer look through your lenses. Their long legs, elongated spine, sharp claws, and long tail equip these animals for speed. They are the fastest land animal in the world and can reach 70-90 mph in just three seconds. Additionally, they can jump as far as 35 feet, and 7-15 feet high. They are very light, ranging between 75-120 lbs., 3.5-4.5 feet long, which supports their speed and agility. Though cheetahs are carnivores, they are no match for their counter lions, or hyenas. 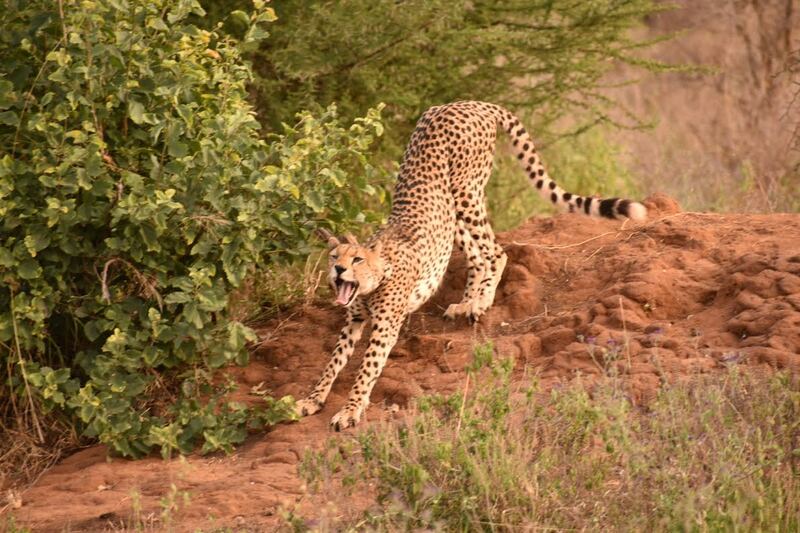 In fact, cheetahs do not eat predators or even challenge predators. Often, hyenas and lions will turn up to steal a cheetah’s pray, and the risk adverse cheetah would rather give up their dinner than risk an injury, which can leave them vulnerable and in danger. Instead, they eat pray including rabbits, warthogs, springboks, gazelles, and birds. Cheetahs consume an average of 6-8 lbs. of food each day, and in some cases may go as long as 4-10 days without water. What would you do if this actually happened to you while you were on safari? While some may panic in fear for their lives, others may welcome the experience. In either case, it is important to remain calm, without any sudden movement or eye contact. In most cases, it is safe to say that a cheetah will not attack a human. We’re bipedal, which deters a cheetah from attacking us. So next time you are on a safari and are lucky enough to spot a cheetah, maybe you’ll get an unexpected visit inside your jeep by some friendly cheetahs!